Searching for Yankee Doodle: Caring for the Sick and Wounded ~ The History Girl! For over 200 years America’s image of the soldiers of the American Revolution was inaccurate! I wrote this book to challenge the myth of the freedom loving nationalistic citizen soldier that was so gratifying to Americans. By probing personal records, and military sources I draw a true picture of the private soldiers, their lives and their motivations, and readers will get some surprises. In the decade that straddled the bicentennial of the nation a small number of historians in different states finally tested the “Golden Myth" of the zealously patriotic yeoman farmer. This research led us all to concur that the popular image of the virtuous citizen-soldier was not the true representation of the common soldier of the American Revolution. We found that the avidly patriotic citizenry of 1775, who rose up at Lexington, Concord, Ticonderoga and Bunker Hill in the first months of the war did not accurately represent the soldiers of the Continental Army. By the final months of 1776, volunteerism had vanished and the zealous patriots who massed around Boston were being replaced by less fortunate members of society. 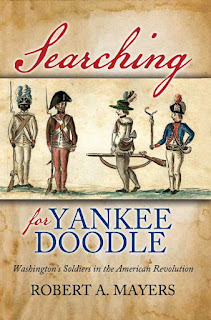 Searching for Yankee Doodle: Washington’s Soldiers of the American Revolution reveals that these men drawn were from the lowest levels of society. They committed for longer terms of service and formed the standing army that lasted through the dark days of the prolonged defensive conflict. These landless and unskilled young men were recruited without regard for aptitude, character, fitness or skill. They were urgently needed to make up a European style army essential to continue the rebellion and achieve final victory. During the Civil War one man in five died, and in World War II one in forty American servicemen perished. In the Continental Army, while bearing arms in the War for Independence, one in four soldiers, about 30,000 Americans, died. Many more men succumbed to illness, rather than wounds. In the first year of the war, one in five died, not in battle, but from illness. For every ten men who joined the Continental Army, one perished miserably in a wretched hospital or in an abominable prison. Many young Patriots took their last breath after exposure to unsanitary conditions, such as lying on filthy straw pallets. Their wounds were not mortal until becoming infected, especially after being sliced with the grimy instruments of surgeons. The few doctors who traveled with the army were equipped only with the surgical tools they could carry in their knapsacks, and if a wound was severe they performed the only useful procedure they knew—amputation. As a result, Continental soldiers prayed to be shot in the head, where death would be quick. Medical issues had a major impact on the entire war. At that time, much was unknown about the causes and treatments of even common ailments. Therefore, anyone with even a rudimentary level of medical knowledge was accepted into the Continental Army to tend the vast numbers of sick and wounded. Army doctors had only a basic idea of how to treat wounds and diseases, and most had had no formal training, since there was no requirement for this to become a doctor. Smallpox and other diseases were another major issue, since these afflictions determined strategies and influenced battles. Over the course of the war, these diseases killed thousands of people. Smallpox was even used as a biological weapon when infected people were sent to infiltrate enemy camps. Each regiment appointed its own physician; such men were usually local doctors who skills were of varying degrees. Fewer than three doctors in the entire country had a medical degree. A few had graduated from the ten-year-old Philadelphia Medical College, while others were graduates of European medical schools in France and Germany. These schools were expensive, and had daunting admission requirements, including knowledge of classical literature and other scholarly subjects. Most students had never been exposed to a live patient, and were routinely instructed in the inaccurate practices of the time. Despite this deficient training, Revolutionary War surgeons did a commendable job of attempting to save lives. Most were brave, honest, and well-intentioned, but the unhygienic conditions and shortages in medical supplies overwhelmed them. Doctors on both sides cared for both friend and foe. After the Battle of Monmouth Court House the British forces evacuated, but left behind forty-four severely wounded officers and men, with only one surgeon to tend them. They were taken to nearby Tennant Church, which was being used as a makeshift hospital, and were cared for by American medical personnel alongside their wounded opponents. Soldiers killed on the battlefield on both sides were collected by the Americans and buried together in the Tennant Churchyard. The army was crippled and hindered by disease in nearly every campaign during the remaining seven years of the war. One of several reasons that Washington hesitated to approve the plan for the Yorktown Campaign, the final decisive operation of the war, was that epidemics were sweeping through the Southern states. After the victory there, he feared the army would fall prey to disease, so he rushed his troops north to the more healthful regions of the Hudson River Valley. There were only nine army hospitals in the northeast in March, 1780. Death rates were high in these primitive facilities, with their close quarters, poor sanitation and contaminated food and water supplies. Only small amounts of medical supplies were available, most likely smuggled in from the West Indies, supplied by the French, or captured from the British. Food and clothing shortages added to the problem. Medical care deteriorated even further in the last years of the war, when completely untrained people were assigned to care for injured and sick soldiers. Medical supplies continued to be scarce, and pain killers of any kind were rare. The dead were carried out of the primitive hospitals and replaced by others, without changing straw or sheets or applying any types of sanitizing precautions. The complete lack of understanding of the causation of illness led to exposure to smallpox, typhoid, dysentery, typhus, pneumonia and tuberculosis. Whooping cough and measles were often fatal. Boils and other skin infections resulted in gangrene and “bodyitch” caused by lice spread over the entire body, which soon developed into impetigo. Floors of huts where soldiers lived during the winters were often below ground level, cold and damp. Rats, mice, cockroaches and other pests quickly invaded these crude dwellings. Latrines were rarely available, and human waste was frequently deposited nearby. This occurred even where strict orders prohibiting the practice were written in orderly books. At the winter encampment at Jockey Hollow a private was given one hundred lashes for urinating in the living area. After animals were slaughtered for food, their remains were left unburied, or even thrown into water sources. Sanitation was a complete mystery to the army. Purification of huts was attempted by filling dwellings with wood smoke, burning tar fumes or sulfur from burnt cartridges. Vinegar was sprinkled over the floor and furnishings. Washington personally ordered huts sanitized by burning the powder of blank musket cartridges each day or by burning pitch or tar. At times wounded men lingered on battlefields for days before being assisted. It was standard practice to amputate arms and legs if bones were shattered. Those with stomach wounds usually died in hours, while others lingered in agony for a few days. The use of unsterilized instruments and dirty dressings caused the mortality rate to escalate. Musket balls, or the bayonet, caused most wounds. In cases where a limb could not be saved, an amputation was performed. This procedure was done without any attempt at sterilization or anesthesia, except possibly rum, brandy or a tobacco juice concoction, if any of these was available. All too often, however, the patient simply “bit the bullet.” A lead musket ball or a wood stick was given to the person to bite down on, and to stifle his screams. Two surgeon’s assistants held the soldier as the process was undertaken. The surgeon used a small bone saw to remove arms, and a larger one to remove a leg above the knee. A leather tourniquet was placed above the point of amputation, and the surgeon cut down to the bone of the damaged limb, and moved arteries aside with curved needles. A leather retractor was placed on the bone, and then pulled back to allow the surgeon a clear area to continue. Arteries were buried in the skin flap, which was then sutured. The end result was bandaged with white linen cloth, and a wool cap was placed on the stump. During this barbarous operation the majority of soldiers went into shock. Regimental surgeons were not well-trained at the beginning of the war, but they soon learned to work fast. Some were able to perform an amputation in less than forty-five seconds. After losing a quantity of blood from the injury, the patient was further weakened by being bled. Surgeons mistakenly believed that this procedure would prevent further disease. In the end, only about 35 percent of amputees survived. Most died of gangrene or from infection that rapidly spread throughout their bodies. The scene after a battle was appalling. When the battle of Guilford Courthouse ended, the dead and dying were scattered over a thousand acres. Shortly after the fighting was over, a torrential rain fell, and finding and treating the wounded became increasingly difficult. There were few doctors present, and little medicine of any kind. Quakers other civilians in the area, along with British surgeons, cared for the wounded of both sides. Houses within an eight-mile radius of Guilford Courthouse were commandeered as hospitals. Arms and legs were amputated, lead balls extracted, and broken bones set. Many wounded died within the week from infections and blood poisoning. A smallpox epidemic then swept through both armies and claimed yet more lives. The Continental Congress was so overwhelmed by other issues that little attention was given to establishing a military medical organization. This neglect was compounded by rivalry among the top medical officers, congressional politics, and corruption by lower level medical officials. They continuously argued about the correct chain of command, and most other issues. The result was that the army medical staff was a mix of militia, civilians, and regular army personnel. Dr. John Morgan, a famous surgeon, was the first Director General. He was a bitter rival of Dr. William Shippen, Director of Hospitals for the Continental Army, a precursor to the Surgeon General of the US Army. Shippen served from April 11, 1777, to January, 1781. He was eventually court-martialed for misappropriating supplies intended for recovering soldiers, and for underreporting deaths. Other medical personnel did a brisk business selling medical discharges. General Washington was appalled at the lack of training and the poor level of competency of the army’s medical personnel, and attempted to require surgeons and surgeon’s mates to take examinations to qualify. Various states fought this screening of their political appointees, so no action was taken until 1782, a year before the war ended, when Congress established a board to scrutinize the qualifications for military surgeons. Washington also persuaded Congress to have surgeons report the number of casualties, so that commanders could separate the dead and wounded from those who had deserted. - Regimental surgeons are to be stationed with their men when in a fort or on a defense line. (To prevent them from being too far away from the action). - Give emergency care only. In the heat of battle, amputation or any capital operation is best avoided. Emergency duties to be carried out directly on the battlefield include: Stop bleeding with lint and compresses, ligatures, or tourniquets. Remove foreign bodies from the wound. Reduce, or set, fractured bones to realign them. Apply dressings to wounds. If the dressings are too tight, blood flow is decreased and will increase inflammation and excite a fever. If the dressings are too loose, fresh bleeding may recur or set bones may displace. If you move someone and the bones are not set tightly enough, the bones will slip out of alignment. - Before each battle, check with the regimental officers for men to carry off the wounded. A supply of wheelbarrows, other convenient biers, or whatever transport is available, is to be secured in order to carry off the wounded. The prevalence of smallpox during the Revolution posed a very real danger to the success of the war. The risk of this deadly disease was a critical factor in military decision-making, and impaired American efforts in the campaigns of 1775 and 1776. Smallpox was a major factor at the Siege of Boston and during the American invasion of Canada. Rumors over the British use of biological warfare, controversy over inoculation, and attempts to control the spread of smallpox all had a major impact on the progress of the war. Recruitment was diminished, desertions increased, and commanding officers were forced to continue operations with decimated forces. This invisible killer affected civilian populations as well. Similar to the Native Americans, the men of the Continental Army came mostly from rural areas, and had little immunity to the disease. Because the population was less dense, Americans often reached adulthood without coming into contact with the smallpox virus. Men sometimes deserted for fear of contracting the deadly disease when it erupted in a camp. In 1775, both Washington’s army outside Boston and the British Army inside the city had their options limited by so many of their men becoming sick. In Europe, smallpox was less of a menace; most people had been exposed to the disease at an early age, so the majority of the adult population was immune. This gave the British Army a major advantage. Most of its troops had already had the disease previously, or had been inoculated. However, the Crown forces were not completely immune. Smallpox has been cited as the reason that the British did not continue to advance inland after they won the major opening battle of the war at Bunker Hill. One of the most important advances in medicine during the American Revolution was the initiation of inoculation in the American Army. George Washington ordered everyone who had not previously been inoculated, or had survived smallpox, to report for inoculation. The procedure in that era was known as variolation, a method of intentionally exposing someone to a mild form of the smallpox virus (Edward Jenner would not develop the smallpox vaccine until 1796). Variolation was an inoculation in which pus from an infected person was injected under the skin of an uninfected one. The process had some risks. Those who had received inoculation would be contagious for a few weeks, so they were isolated. Others could actually die of the disease that they were trying to avoid. Apprehensive soldiers resisted his controversial order, but despite the uproar, it reduced the rate of smallpox deaths in the Continental Army from 17 to 1 percent. John Adams, a delegate to the Continental Congress, had been inoculated against smallpox in 1764, but it had made him extremely ill. In the summer of 1776 Adams’ wife Abigail informed him that she and their four children were going to be inoculated. John Adams wrote back saying that he was terrified, but because of the urgent activities at Congress he could not be with them in Boston during that critical time. He requested daily updates. Fortunately, the inoculations for the Adams family were successful. One of the four children inoculated was John Quincy Adams, who later became the sixth president of the United States. As commander, Washington had seen first-hand the tragic effect of the disease on both the civilian and military population. This prompted him to convince his wife, Martha, to be inoculated in 1776. She underwent the procedure in Philadelphia, where she was treated by Dr. William Shippen. Washington wrote to his brother John from Philadelphia, “Mrs. Washington is now under inoculation in the city; and will, I expect, have the smallpox favourably, this is my 13th day and she has had very few Pustules; she would have wrote to my sister but thought it prudent not to do so, notwithstanding there could be little danger in conveying the Infection in this manner.” Martha underwent a three week quarantine following the procedure, and Washington remained with her for about a week in the rooms they had rented in a local inn. Washington was initially hesitant to inoculate the troops, as such a large scale effort presented problems. He feared that his army would be vulnerable during the short period they were incapacitated following the procedure, noting that, “Should we inoculate generally, the enemy, knowing it, will certainly take advantage of our situation.” He also feared that those who were temporarily disabled might spread the disease. By February, Washington had designed a plan to deal with the disease. He wrote to John Hancock on February 5, 1777, “The small pox has made such Head in every Quarter that I find it impossible to keep it from spreading thro’ the whole Army in the natural way. I have therefore determined, not only to inoculate all the Troops now here, that have not had it, but shall order Docr Shippen to inoculate the Recruits as fast as they come in to Philadelphia. They will lose no time, because they will go thro’ the disorder while their cloathing Arms and accoutrements are getting ready.” He did not wait for a reply from Congress; he issued orders to begin mass inoculation the very next day. Although the procedure produced only a mild infection, soldiers could be sick for days, so all recruits who had not already contracted the disease were inoculated and quarantined in special camps, before they were combined with the main army. Hospitals were set up to perform mass inoculations, and the program was conducted with great secrecy. Thousands of soldiers were inoculated at Valley Forge in the winter of 1777-1778, but as the year began in the dreary camp 3,000 to 4,000 troops still had still not been vaccinated, so in January, 1778, the program was expanded. Washington’s personal involvement in this massive health issue is one of his most impressive accomplishments of the war. Washington had his own immunity to smallpox, acquired in the “natural way.” He survived a case of smallpox when still a teenager and the pock marks on his face were a testament to this. The program was highly successful; smallpox was no longer a major problem for the remainder of the war. It is interesting to hypothesize that if smallpox inoculations had been performed earlier, the outbreak among Continental soldiers in Quebec could have been avoided. This could have ended the Revolutionary War and allowed Canada to be annexed by the United States. Medical treatment facilities had to travel with the fighting forces on campaigns, advancing or retreating with the army. Mobile field facilities became known as “Flying Hospitals.” The wounded were carried or hobbled into these huts, tents, or at times barns, homes, colleges, and churches. Attempts were made to place them in relatively secure areas away from any action. They were equipped with a few emergency beds, and a surgeon’s table. These were the crude precursors to the M.A.S.H. units in recent wars. General Hospitals were more permanent, and were located in public and private buildings. Major facilities were located in Providence and Newport in Rhode Island, Peekskill, Fishkill, and Albany in New York, Hackensack, Fort Lee, Elizabeth, Morristown, Perth Amboy, New Brunswick, and Trenton in New Jersey, Bethlehem, Bristol, Reading, Lancaster, Manheim, and Philadelphia, Pennsylvania, and Alexandria and Williamsburg (the Governor’s Palace) in Virginia. The dead were buried in unmarked graves in grounds adjoining the hospitals. The Continental Army managed these sites, and often assigned soldiers who were not suited for military life to work in the hospitals. In remote regions conditions were worse. There was no hospital at Peekskill, New York during a period when 5,000 men were stationed there. The hospital at Albany, New York, in 1781, was completely without supplies except for bad vinegar, and patients went without food for days at a time. Those who could walk were encouraged to beg for food in the town. 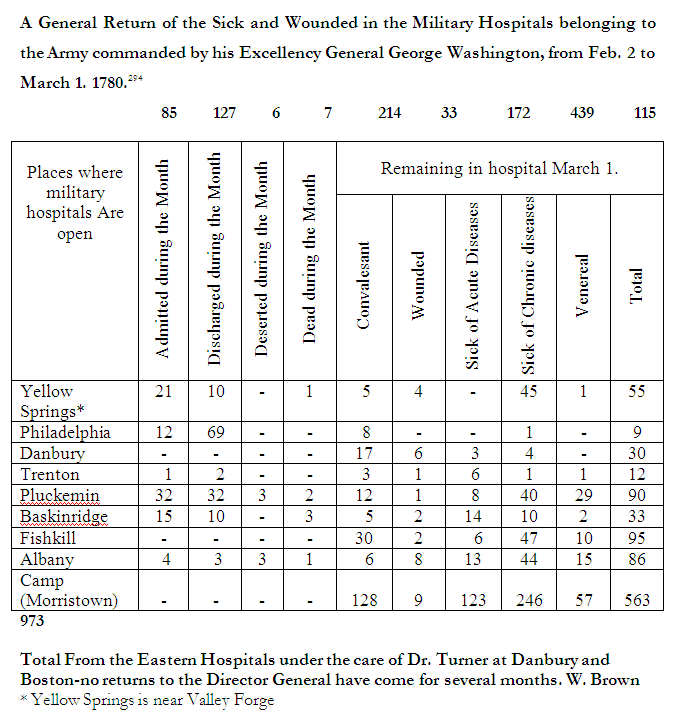 In 1780, no military hospital at all existed in the entire state of Virginia. During the Southern Campaign in 1781, General Nathanael Greene reported that the few army hospitals that did exist were “shocking to humanity.” He appealed to Congress for assistance: “Without medicine and destitute of stores and every article of necessity to render the sick comfortable, for want of a surgeon and supplies soldiers were being eaten up by maggots.” He stated that sickness among troops in the South was over five times that in the North. He never received a response. Many American leaders, including Franklin and Washington, believed that the British had a plan to deliberately spread smallpox in the Continental Army. When a commission appointed by Congress sent reports on the war to Benjamin Franklin in France, they commented favorably on the mass inoculation initiated by Washington. They also reported that the program would, “. . . frustrate a Cannibal Scheme of our Enemies who have constantly fought us with that disease by introducing it among our troops.” Suspicion of a covert British effort to spread disease among the American troops remained persistent throughout the war. When the American Siege of Boston began in April, 1775, smallpox was raging among civilians there. Washington suspected that some of them were leaving the city on purpose, in hopes of spreading the disease among the Continentals. He believed that the British had deliberately infected people with smallpox, and then they sent them out to mix with the American forces. At first Washington and his staff thought these reports were ridiculous, but he soon wrote to John Hancock, “The information I received that the enemy intended Spreading the Small pox amongst us, I could not Suppose them Capable of—I now must give Some Credit to it, as it has made its appearance on Several of those who last came out of Boston.” In December deserters arriving at the American lines reported that “Several persons are to be sent out of Boston that have been inoculated with the small-pox” with the intention of spreading the infection. A Boston physician admitted “that he had effectually given the distemper among those people” who were leaving the city. When the British expedition arrived in Virginia in 1781, General Alexander Leslie plotted with Cornwallis to spread disease among the Americans. He planned to send “about 700 Negroes down the River with the Small Pox, the Rebell Plantations.” It is not known if he carried out his plan. In the last years of the war, the British began reneging on their promise of freedom. African Americans, who had staked their lives on British promises of liberty, were forced to return to their masters. American leaders, however, suspected the enemy had an ulterior motive, and insisted that the British had sent a large number of Negroes with small pox from Yorktown for the purpose of communicating the infection. If the British were trying to spread smallpox to the American Army at Yorktown they were too late—the Patriots there were immune, since they had been inoculated in 1777 and 1778. Although the army was successful in eradicating smallpox, many other health issues had a major impact during the Revolutionary War. Doctors’ knowledge of medical issues was very basic and generally faulty, and many lacked any formal training. There were few hospitals, surgical instruments were rudimentary, and much was yet to be discovered about the causes and treatments of common ailments. Living in close quarters with poor sanitation and hygiene, eating contaminated food and drinking from foul water supplies, all contributed to the rampant spread of disease in army camps. Although medical practices were appalling during the Revolutionary War, they did result in some long range positive effects. Basic principles of sanitation and hygiene were initiated, and the importance of smallpox inoculation was accepted. A policy for battlefield treatment and evacuation of the wounded was established, and a military medical department created. However, significant and adequate advancements in the practice of surgery and anesthesia for the army did not occur until many years in the future. The people most responsible for achieving America's independence by winning the Revolutionary War were George Washington's foot soldiers-the men of the Continental Army. Who were they, and what was it that inspired them to endure such appalling hardships throughout the conflict? What was their life like during and after the war? And what is their legacy? In an effort to uncover the facts about these men, author and historian Bob Mayers has scoured through obscure documentary material and little known British, Hessian, and Loyalist records to unearth truths that challenge traditional beliefs about Washington's soldiers. The fighting men and women of the Revolution were incorrectly portrayed as zealously patriotic citizen-soldiers, when in reality they were professionals dedicated to the American cause. This realization lies at the heart of the book, and propels the narrative along in a way that is entertaining and enlightening. Corroborated with excerpts borrowed from personal diaries and records, these men (and women!) are once again brought to life, in a way that allows us to understand their personalities through their behavior and deeds. Mayers goes on to study all aspects of the conflict, including the various outfits worn by the regiments, the treatment of the sick, the punishment of offenders, and training of the regiments. In the end the reader will experience a new familiarity with the war's participants. Expertly designed, the book is fortified with fifty-five images in twenty-two chapters, all of which is intended be enjoyed by the average reader, and not just the hard-core history fan. Included is a comprehensive chapter on researching individual Revolutionary War veterans, and four appendices-the makeup of a regiment, distribution of regiments by state, names and publication sources of diarists, and an actual muster roll-that provide useful supplementary information. Robert Mayers is a storyteller, in the best sense of the word, and a dedicated historian and genealogist. As the descendant of patriot soldier Corporal John Allison, the American Revolution is very personal to him. He is an active member of ten historical societies and is a frequent speaker and contributor to their publications. His service as a combat officer in both the Navy and the Marine Corps provides him with a deeper perspective of the many battles depicted in his work. He is a graduate of Rutgers University and served as an adjunct professor at Seton Hall University. 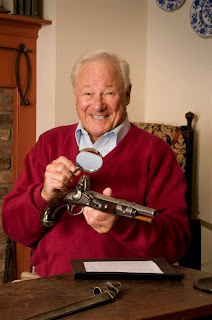 A resident of Somerset County, New Jersey, his previously published book, The War Man, (Westholme, 2009) is the biography of Corporal John Allison, who fought all eight years of the Revolutionary War. Mayers’ also authored the Allison/Mayers Family History — The Portrait of an American Family,” covering 600 years of the family’s history. Mayers' work has been featured in History Channel Magazine, Garden State Legacy, and Comcast TV Programs. Visit his web site, www.revolutionarydetective.com. 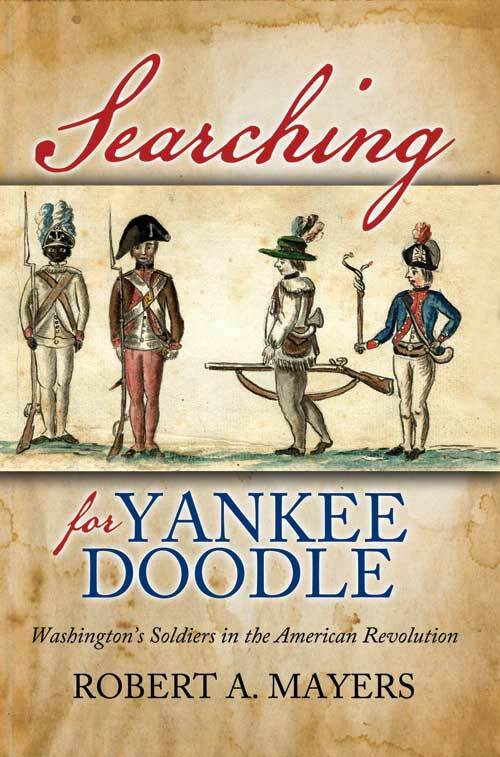 Purchase a copy of his latest book, Searching for Yankee Doodle: Washington's Soldiers in the American Revolution.